The satellite launched by North Korea on Wednesday (Dec. 12) is "tumbling out of control," according to U.S. officials, NBC News reported. The vehicle is in an uncontrolled orbit around Earth, and officials aren't sure what the spacecraft's purpose and capabilities are, NBC News reported. 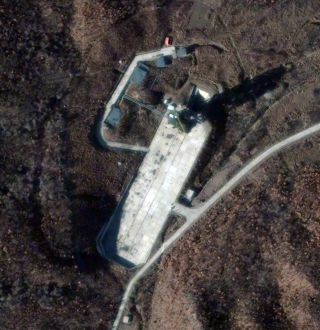 North Korea lofted the spacecraft on its long-range Unha-3 rocket Wednesday at 9:49 a.m. local time (7:49 p.m. EST on Tuesday) from Sohae Satellite Launch Station on the nation's northwest coast. The liftoff sparked widespread international objections. The White House National Security Council called the launch "a highly provocative act that threatens regional security, directly violates United Nations Security Council resolutions 1718 and 1874, contravenes North Korea’s international obligations, and undermines the global non-proliferation regime," in a statement from NSC spokesman Tommy Vietor. The United States shares concerns with South Korea and other nations that North Korea's forays into space are thinly veiled attempts to develop and test nuclear missile delivery technology. The launch was detected by U.S. missile warning systems, and North American Aerospace Defense Command (NORAD) officials said the Unha-3 rocket's first stage fell into the Yellow Sea, while the second stage fell into the Philippine Sea. "Initial indications are that the missile deployed an object that appeared to achieve orbit. At no time was the missile or the resultant debris a threat to North America," NORAD officials said in a statement. The launch was not the first for North Korea, but it may have been the most successful, despite the satellite's apparent loss of control. When North Korea attempted to loft a spacecraft to orbit this past April, the rocket failed shortly after liftoff, and similar attempts in 1998 and 2009 also went awry.